You might have to click through to watch it due to copyright restrictions. (Thanks to Adam Stamp for submitting this). Get the details here on Facebook. Plus, here is a bigger scan of the album art, which I will henceforth refer to as "puppet death his banana buddy". The best/worst publicity shot ever? Found on the 2011 APRA Popular Contemporary Finalists page. (You have to scroll way, way down). I’m pretty sure the bonus track is this one. 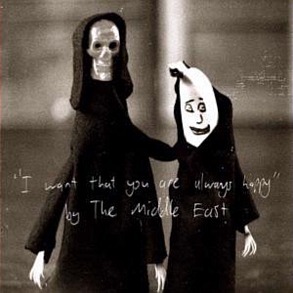 You are currently browsing the The Middle East blog archives for March, 2011.